Named for explorer Ferdinand Magellan, who led the first European expedition to circumnavigate the globe, the Large and Small Magellanic Clouds are the Milky Way's nearest galactic neighbors—companion galaxies that will someday merge with our galaxy. The two galaxies are visible only from the Southern Hemisphere, where they look like bright, wispy clouds. Although humans have gazed at the Clouds for millennia, this is the first time astronomers have made a detailed map of the chemical compositions of the stars within them. The project, carried out by the Sloan Digital Sky Survey (SDSS), was led by NOAO astronomer David Nidever, who is also a research professor of physics at Montana State University. "We mapped the positions, movements, and chemical make-up of thousands of stars in the Magellanic Clouds," said Nidever. "Reading these maps helps us reconstruct the history of when these galaxies formed their stars." The maps are the first major discovery to come out of the new southern operations of SDSS's Apache Point Observatory Galaxy Evolution Experiment 2 (APOGEE-2) survey, which is being carried out on the Irénée du Pont Telescope at Las Campanas Observatory in Chile. Taken with the European Southern Observatory's Gaia Satellite, the maps show the relative abundance of heavy elements (elements heavier than helium) in the stars. Yellow indicates fewer heavy elements and purple indicates more heavy elements. Credit: David Nidever (NOAO/Montana State University) and the SDSS collaboration. To make the maps, the SDSS team collected spectra of as many stars as possible. Spectra, which spread out the light from a star in the form of a rainbow, encode the motions of stars, their temperature, the chemical elements they contain, and their stage in the stellar life cycle. By measuring the chemical make-up of a galaxy's stars, astronomers are able to infer their "star formation history," a rough record of the rate at which stars formed over time. The reconstruction is possible because of the difference in the lifetimes of stars of different masses and the role more massive stars play in enriching galaxies with heavy elements. As stars age, stars more massive than the Sun evolve and explode as supernovae, ejecting heavy elements out into the galaxy, while less massive stars live on. The ejected elements mix with the existing gas, enriching it. New generations of stars form from the enriched gas and inherit that chemical make-up. The process repeats, with the longer-lived lower mass stars surviving to record the enrichment history of the galaxy. By mapping the abundances of these stars, astronomers can "read" the star formation record of the galaxy. From models based on APOGEE chemical abundances (from Christian Hayes of the University of Virginia). The Large Magellanic Cloud curve has been scaled up by a factor of 20 for ease of comparison. While star formation in the Milky Way was rapid at early times and then declined, the history of the Large Magellanic Cloud is almost completely the reverse: star formation was extremely slow at early times and increased dramatically in the last 2 billion years. Credit: David Nidever (NOAO/Montana State University). The results show that the star formation history of the Large and Small Magellanic Clouds is completely different from that of our galaxy. 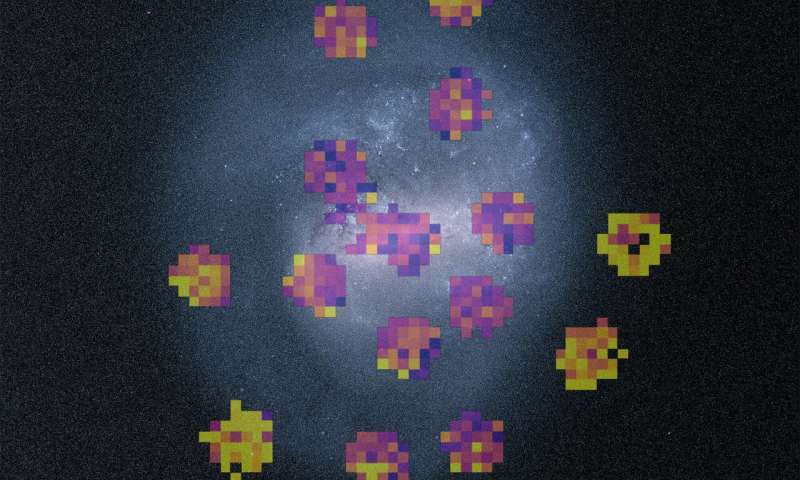 "In the Milky Way, star formation began like gangbusters and later declined," explained team member Sten Hasselquist from the University of Utah. 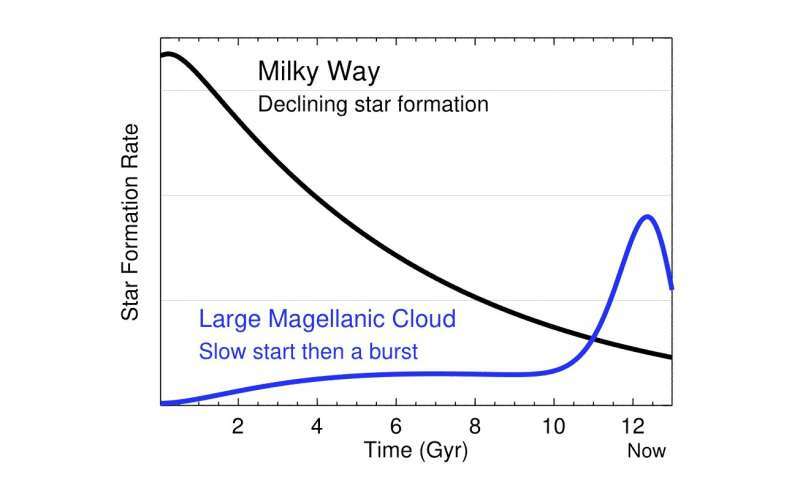 "In contrast, in the Magellanic Clouds, stars formed extremely slowly at early times, at a rate only 1/50th of the star formation rate in the Milky Way, but that rate has skyrocketed in the last 2 billion years." 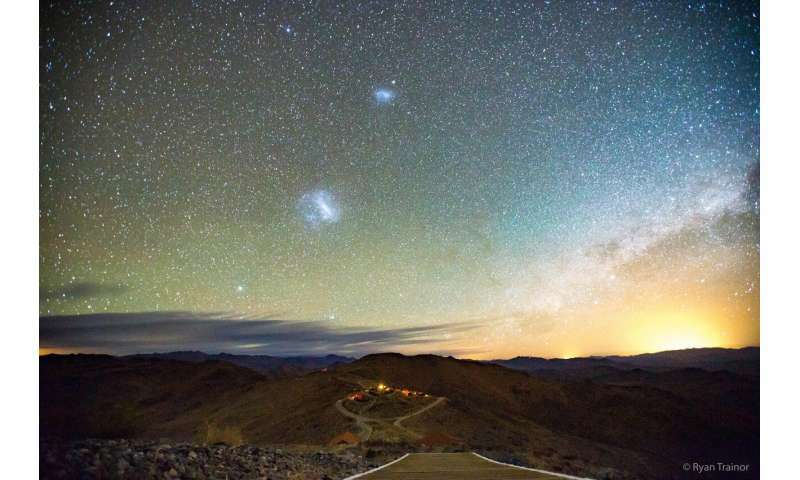 Nidever thinks that the dramatic increase in the star formation rate is due to the interaction of the Magellanic Clouds with one another as they tumble toward the Milky Way. "The Clouds began their lives calmly in a relatively isolated part of the Universe, where there was no reason to form stars," said Nidever. "But in the last few billion years, the close interactions that the Clouds have had with each other and with the Milky Way is causing the gas in the Clouds to transform into stars." The results were presented 9 January 2019 at the 233rd meeting of the American Astronomical Society. I'm waiting for someone to find a new star. Hold up a good resolution image from a telescope taken a decade ago alongside an image of the same space taken today and point to a new star that wasn't in the first image.